Today's Memorabilia is something that will be familiar to a lot of people. In fact, anyone who shopped at Acme from about 1995 to 2015! 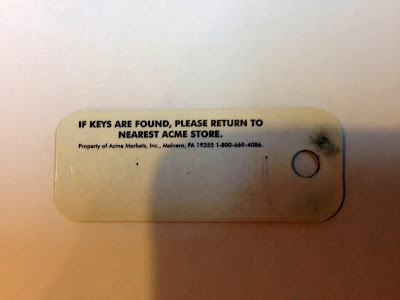 Early 2000s Acme SuperCard. When Acme opened in a former A&P near my grandmother, she attempted to use her SuperCard, insisting she wouldn't get the discounts without it. I pointed out to her the enormous CARD-FREE SAVINGS banners that happened to be hung over almost every register. I guess the bar code has rubbed off of this one. Awesome! I got my set of Supercards... after they ended the program. Apparently I missed out on everything pretty much... especially Acme and A&P worthy. I apparently wasn't a smart shopper back then, either! Oh well. You know, figuring out which club cards are important can be maddening -- some stores have them, some have them but rarely have sales with them, some stores used to have them and don't any more, some stores don't have them. Some chains accept the card at one location and not at another, and some cards are only valid at one location. Frustrating for someone like me, who shops at a different place every week!